Although I’ve lived and worked in Central London for eight years, I’d never been to Handel House before; but this morning I went to the Queen’s Gallery to see their First Georgians exhibition before it closed, and this offered the perfect complement. All in all, it was a very Georgian day out. The contrast between the two views of 18th-century London was telling. The Queen’s Gallery understandably presents a very elevated view of the period – paintings, furniture, battles and politics – whereas Handel House offers a glimpse of a more down-to-earth, scurrilous, energetic London: a ‘teeming, filthy, vibrant city’, the largest metropolis in Europe, full of appealingly larger-than-life characters. It is only a glimpse, but it leaves you keen to find out more about the personalities you encounter. Handel moved into 25 Brook Street just after it had been built in 1723 and remained there for the rest of his life. It isn’t a large house but it didn’t need to be: he never married and so it’s effectively a bachelor pad, not far from the King’s Theatre on the Haymarket where he staged most of his operas, and with just enough space for him to rehearse with his singers and musicians. You can visit five rooms at present: Handel’s dressing room; his bedroom; his rehearsal room and his composing room, plus an exhibition space (more on the current display in the next post). All are striking for their modest size: it’s incredible to think that many of Handel’s greatest operas, not to mention the Messiah and the Water Music, were composed in this little townhouse. Interior decoration is modest to say the least: there are some striking pieces of furniture, such as the four-poster bed, and an elegant harpsichord down in the Rehearsal Room, but for me the primary interest came from the prints and pictures. These bring Handel’s London to life by introducing us to his colleagues and contemporaries, both troublesome and benign. One of the former was the Owen McSwiny, the roguish manager of the (then) Queen’s Theatre. He scarpered with the profits of Handel’s Teseo in January 1713 and, having been declared bankrupt, went off post-haste to Italy, where he dreamed up an elaborate scheme to commission paintings of allegorical monuments to British grandees (needless to say it didn’t come off). With managers like that, who needs enemies? But Handel’s greatest headaches probably came from the singers he had to work with: most memorably Faustina Bordoni and Francesca Cuzzoni, whose on-stage rivalry led to fights between their fans, but also stimulated Handel to write Alessandro, in which he strove to keep both his leading ladies happy by giving them roles of equal stature. However, it doesn’t bode well when the most famous anecdote about a composer’s relationship with his prima donna (Cuzzoni) concerns him threatening to throw her out the window if she kept refusing to sing the aria he’d written for her. Next to this tempestuousness, the men must have been comparatively easy to deal with; although, since Caffarelli was among their numbers, everything is relative. In the Rehearsal Room you can see pictures of many of these singers, including prints of four of the castrati Handel worked with: Gizziello (Caffarelli’s sweeter-tempered rival), Carestini, Farinelli (unflattering) and Senesino. 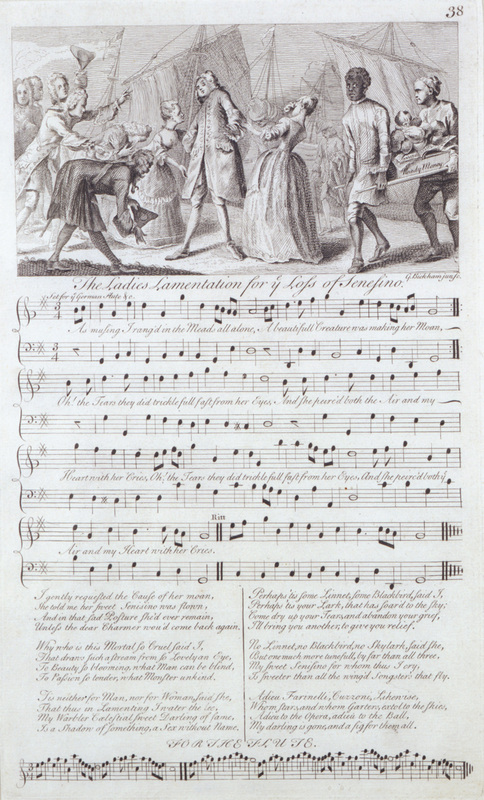 I was also delighted to see a copy of the popular song The Ladies’ Lamentation for the Loss of Senesino, which was mentioned in The Castrato and his Wife, and which pokes fun at the English women left disconsolate by the singer’s departure. It isn’t a large museum and a little prior knowledge helps to get the most out of the pictures on display; but it’s definitely worth a visit if you do enjoy the odd bit of 18th-century opera. There’s a programme of lectures and concerts, which I’ll be keeping an eye on, and the little shop has a good selection of Handel CDs and a few DVDs, which just happened to include the Glyndebourne Giulio Cesare I’ve been after. All in all, it was a thoroughly enjoyable afternoon. Oh, the men were a handful as well. Carestini bitched about having to sing Verdi prati (he thought it boring) from Alcina, which then turned out to be one of the best known arias. Good thing Handel trusted himself and not his singers 😉 I've once passed by the house but have not made it inside yet. Must do one of these days, just to see where all the good stuff was written. There's something about seeing his operas in London, where they were written. As, I said, everything's relative. 😉 Wasn't it Carestini who stalked off and ended up being chased down the street by Handel, who was shouting (in a German accent), “If you don't sing what I write for you, you won't sing anything at all?” or something along those lines? And I loved the idea of Handel's rehearsals being peppered with energetic swearing at his singers in several languages. After having been round, I wondered why no one has yet made a film about Handel's life in London. What with people like McSwiny and all the singers throwing their weight around, not to mention the general Georgian setting, and the fact the soundtrack's ready-made, you'd think it would be a gift to a screenwriter. Ah, that would definitely make it a lot more fun. We'd probably have to kick off with one of the big moments to make a prologue that'd grip people's attention – the first performance of the Messiah, or Zadok the Priest at George II's coronation, or the Music for the Royal Fireworks, complete with the adoring audience, Handel being congratulated by all and sundry, etc. etc… fade out… fade in again as a much younger Handel arrives in London, probably on a day like today, with the rain and mist slowly unveiling the skyline of St Paul's and the City, while the young composer visibly gathers his courage and wonders why on earth he's agreed to come to a place like this… Probably followed soon afterwards by the first of many scenes with temperamental singers flinging their arms around and agitating in Italian, before Handel manages to assert his authority with an equally irascible flood of German… 😉 Hmm. I think this could work… And the costume design would be a *dream*.